Explanation: Nineteenth century science fiction author Jules Verne wrote visionary works about Extraordinary Voyages including tales of space flight and the story of a journey From the Earth to the Moon. Fittingly, the European Space Agency's newly developed Automated Transfer Vehicle (ATV), a robotic spacecraft intended to deliver cargo to the International Space Station (ISS) was named in his honor and successfully docked with the ISS earlier this year. 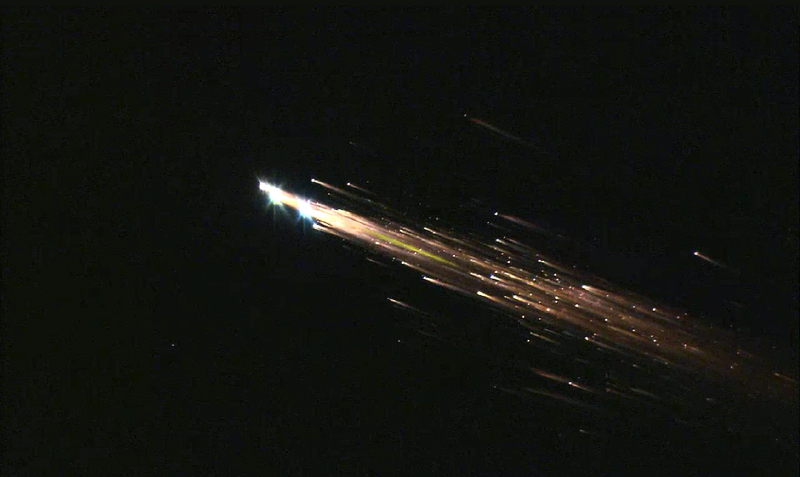 When the Jules Verne ATV was undocked and deorbited last month, its safely controlled reentry over the Pacific Ocean was followed by astronomers in order to make detailed comparisons of the actual event with computer models of spacecraft reentry and breakup in the atmosphere. This dramatic image of the fragmenting, 13-ton spacecraft is a high definition video frame recorded from NASA's DC-8 Airborne Laboratory. The observations were part of the joint ESA/NASA Jules Verne Multi-Instrument Aircraft Campaign.